Heated enclosures for emergency showers are now available from B-L-S Industries, these units offer protection from the cold weather and also privacy if removal of clothing is necessary. Standard enclosures for shower and eye wash are 4' x 5' x 8'-3 1/2". Enclosures with tempered water systems are 4' x 8' x 8'-3 1/2" with a shower room and a utility room. Shower rooms have double swinging doors with Lexan windows and weather seals. 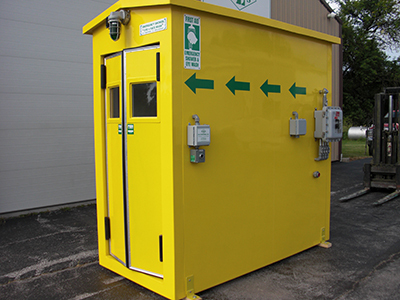 Enclosure walls are 2 1/2" thick Polyurethane insulation enclosed in a fire retardant FRP yellow Gel coat cover. Hold down tabs are attached at the corners for anchoring. Units are designed for forklift use. Shower enclosures come with the emergency shower and all options completely assembled and ready to use after hook up to water and electrical supplies.